Nebraskans will be able to view roadways from Nebraska Transportation plows actively working to remove snow. 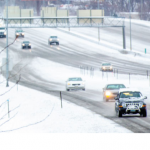 Transportation Department spokesmen say the Plow Tracker online works as a complement to the Nebraska 511 system, which informs travelers of road conditions throughout the State. They add that motorists will have access to additional information to help them make informed decisions prior to traveling. information regarding snow removal operations. Thanks to NDOT’s online Plow Tracker, drivers will be able to get a view of the roadway from plows actively working to remove snow going online at: <https://plows.nebraska.gov/index.html>.